The expertise and quality you've been looking for. From our free in-home estimates to our Total Quality Control Process, SMO Energy ensures that you receive the most optimized and cost-effective home heating and cooling solution available today. Never be uncomfortable in your home again! Find out how SMO Energy can make your home more comfortable with a new heat pump. SMO Energy knows heating and cooling equipment. Our team of energy consultants brings decades of industry experience into each installation, and many even started their careers as technicians themselves. Our energy consultants will provide you with expert advice on your total home energy use, far beyond what you would get from other installers. During our free in-home energy consultations, we want to see your current system and understand your goals. We recognize that each home requires a unique solution. Whether you are looking for greater comfort, cleaner air, lower energy bills, more efficiency, or energy savings, we will find the system to meet your needs. All new heat pump purchases go through our Total Quality Control Process, an in-depth technical review to ensure that the equipment you purchase will meet your expectations and be delivered on time. This customized process ensures that your system is optimized to make your home comfortable while minimizing your cost. We take your safety seriously and arrange for all permits and inspections during your installation. 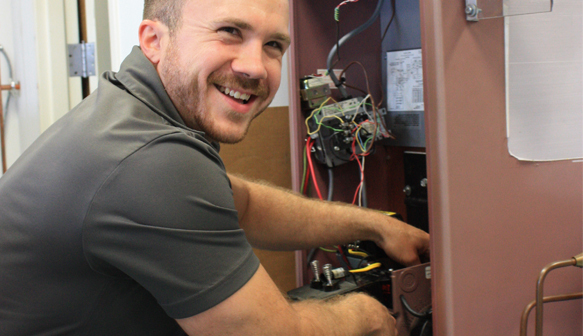 On the day of your heat pump installation, you can feel good knowing that our installers are third-party certified through the North American Technician Excellence (NATE) Certification Program. SMO Energy has been family owned and operated for 93 years, and we will be here for years to come. We stand behind our work with our SMO Energy Satisfaction Guarantee. Every heat pump installation is fully backed by our factory-trained and supported teams, and we have access to a large selection of National Brands with local factory parts and support. We take pride in our work and make sure every installation is done right the first time. We're also proud to offer a full array of payment options for your convenience. "I've found that between the sales agent who initially signed me up as a new customer, to your delivery driver(s), all have been outstanding professionals to deal with. Each facet of these dedicated employees' performance ensures SMO maintains its reputation to be a top-of-the-line local business." Start making your home more comfortable today! Fill out the form on this page or call us to schedule your free in-home consultation.